Two years ago, I trained in a 200hr yoga teacher training course in Thailand. I passed but I never left feeling truly confident at teaching the series and through that lack of confidence, I never pursued Yoga teaching. along with making the time to do my homework and write essays, I also had to continue to run my everyday life. The mundane things, such as making sure I’d done the supermarket shop, walked the dog a couple of times, did the washing ( a lot of washing with the amount of yoga kit and towels I was getting through). It was going to be quite a juggling act. Thankfully, my teacher Gemma Williams is one of the most concise, patient, enthusiastic and encouraging people I have met. I am 47years old and it’s been a while since I have studied so passionately and excessively. Everything was broken down in to clear modules and the homework I was given gave me a better understanding on everything we touched on in class. Gemma encouraged me to be myself as a teacher and built my confidence massively, breaking down every posture, the effect of each has on the body, the parts of the anatomy the postures improved and to show this from beginner level up to advanced. During the course Aftab (a successful business mind and owner of DHY) ran me through how to start a business and where I go / what I do with my teaching skills once the course is over. This is an important part of the course as after paying a fee and putting in a month of time and effort, there is nothing more daunting than the question ‘What now?’ and nothing more depressing than coming up with a blank. Before I qualified I was given the opportunity to teach four 90 minute classes to friends and family at the DHY studio and this was a huge help to me. This was particularly important to the DHY team as they knew from the off start that my confidence levels were an issue and were determined to crack this. Under the watchful eye of Gemma and constructive feedback afterwards, with each class my confidence, teaching ability and dialogue improved massively. 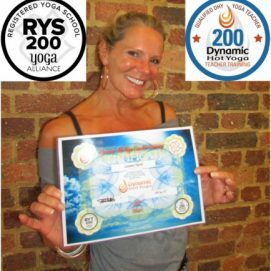 I have passed the 200hr DHY yoga teaching qualification. Since then I have started teaching classes there and I love teaching. I know what I am saying, what I am doing and why. I AM A YOGA TEACHER…. I can say that loud and proud.